Customer Service Attendant works in specific areas in an organization and ensures that the place and surroundings are clean and organized, the role of these attendants differ from Company to company, however the typical Customer Service Attendant Resume lists some core duties like developing inventory management, addressing customer needs, training new attendants, managing due collections, maintenance, supervise on night shifts, greeting customers and solving conflicts. Summary : Creative and results-driven Customer Service Attendant with 7 plus years of experience and with a solid academic grounding and an exemplary performance record in business management, new business development, revenue generation, market share expansion, cash management, restaurant staff direction, as well as delivering customer service support of the highest standard. Demonstrate adaptability, as well as fast and eager learning mindset. Providing support in conducting market research, making arrangements for promotional events and assist in writing reports and analyzing data. Contributing to the development of promotional materials to promote, market, and advertising the restaurant services and products. Establishing, developing and maintaining the business relationships with current and prospective customers. Co-managing the busy restaurant facility on as needed basis, serving as a point of reference to customers and staff. Building a good rapport with all customers and resolve any complaints/issues quickly to maintain high-quality customer service and to ensure a top-notch customer experience. Utilizing high levels of energy and superior multi-tasking abilities to quickly fill food/ drink orders in this extremely fast-paced establishment. Coordinating with other restaurant staff to ensure that all the received food and beverage items met the standards and specifications set by the management. Using excellent communication skills to provide a high level of customer service and client relations while demonstrating attention to detail, flexibility, and innovation in resolving problems. 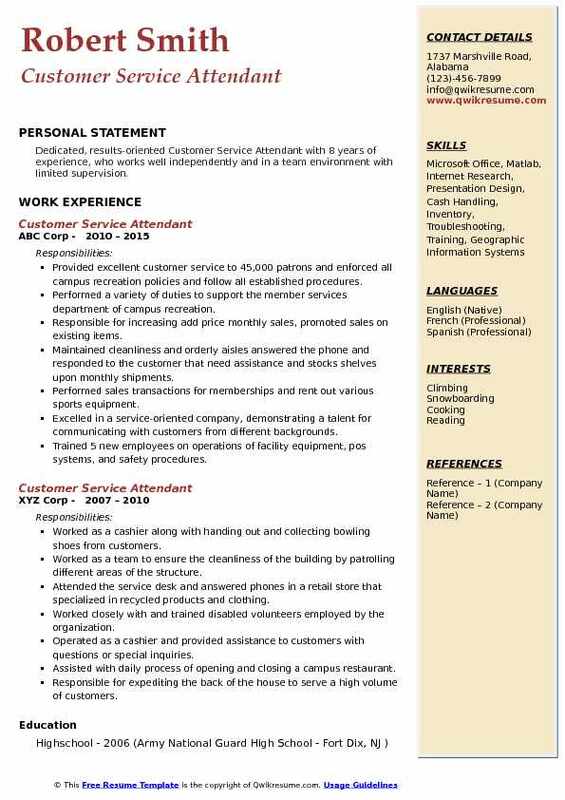 Summary : Enthusiastic, resourceful Customer Service Attendant with 7 years of experience looking to join a career-oriented company while having a prior academic background in accounting and professional background in customer service and the ability to establish priorities and meet challenges head-on. Communicated with vendors regarding incoming orders, future orders, and old inventory becoming store credit. Ensured a superior customer experience by addressing customer concerns, demonstrating empathy and resolving. Ensured a clean and orderly working environment to promote safety and efficiency. 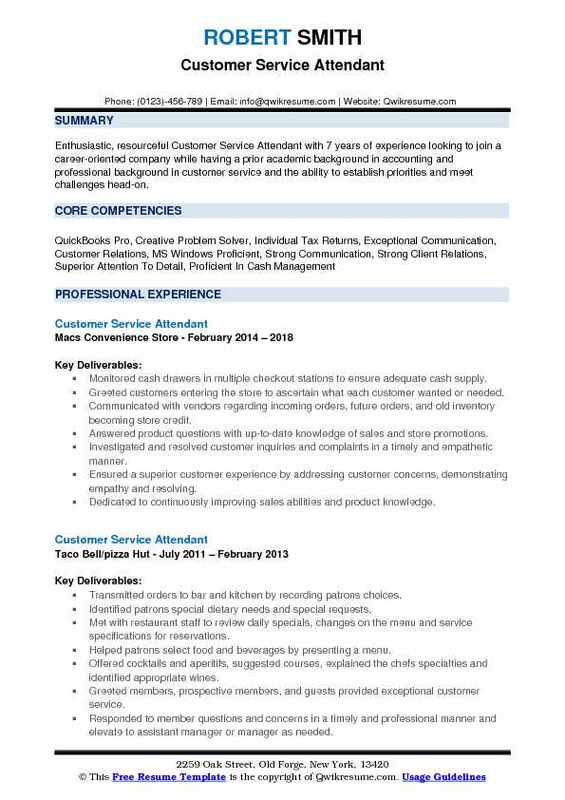 Objective : Customer Service Attendant with 4 plus years of experience seeking employment with a company where I can use my talent and skills to grow and expand further. Answering customers questions, and providing information on procedures or policies. Speaking with the patrons to ensure satisfaction with service, to respond to complaints, or to make conversation. Inspecting the restrooms for cleanliness and availability of supplies and clean restrooms when necessary. Perform customer service duties for travelers, both day and night. Run the cash. Resolve customer problems by determining the cause and finding the best solution. Process clients paperwork, answer phones, handling customer questions and complaints. Objective : Customer Service Attendant with one plus years of experience in providing exceptional customer service and Phone, creating customer-centric environments within a few stores. Competent, dependable professional equipped with basic selling skills, in-depth knowledge of business and retail operations and merchandising. 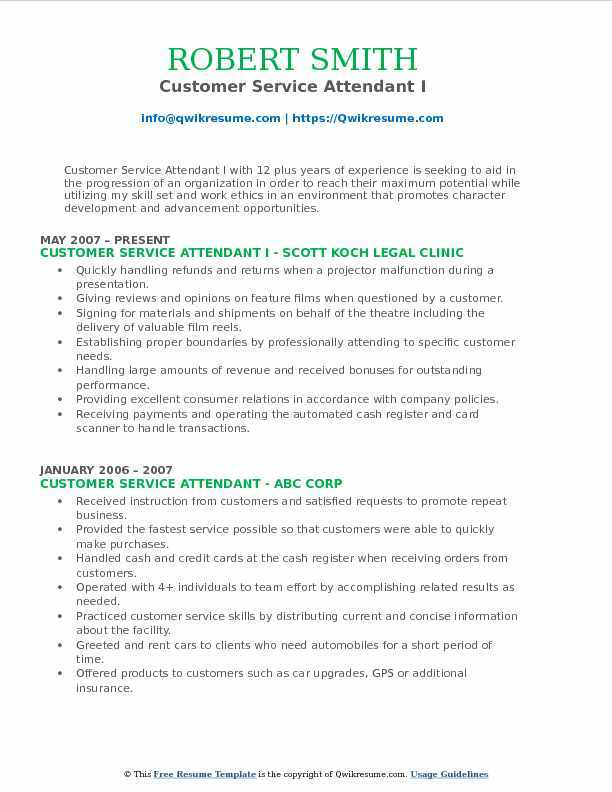 Issued receipts, refunds, credits, or change due to customers. Cash handling. Established or identified prices of goods, services or admission, and tabulated bills. Answered customers questions, and provided information on procedures or policies. Followed up with every regular customer each week to verify that they were satisfied with purchases. Displayed consummate professionalism and proficiency through knowledge, understanding, and application of policies and standards. 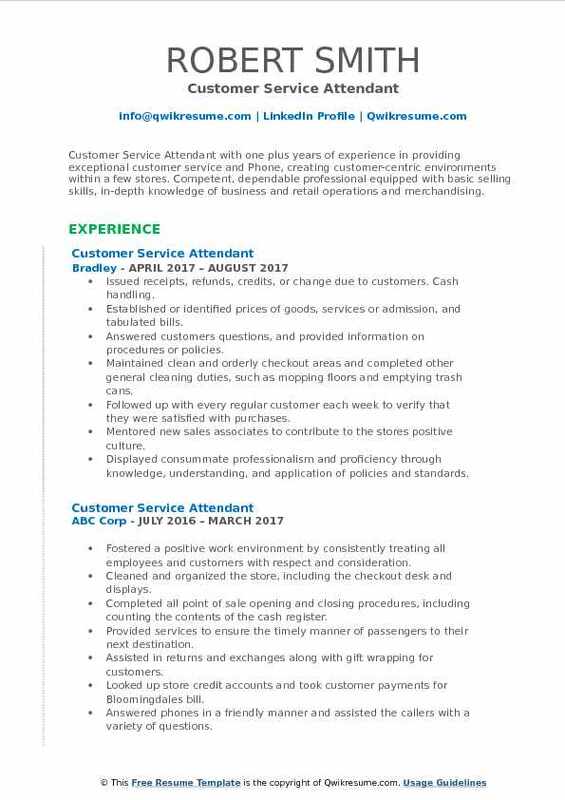 Objective : Highly motivated Customer Service Attendant with extensive customer service and retail experience. I am currently seeking to obtain an opportunity in an exciting industry and business. I strive to be an active part of a successful organization through personal achievement, creativity, and productive teamwork. I want to grow as an individual with personal values of self-responsibility and hard work. Greeted customers entering the store and acknowledged the customers wants and needs. Provided quality customer service to patrons by assisting all needs quickly and professionally. Ensured customer satisfaction by assisting with order selection and completion. Completed store closing duties to include proper food storage, cleaning, and security detail. 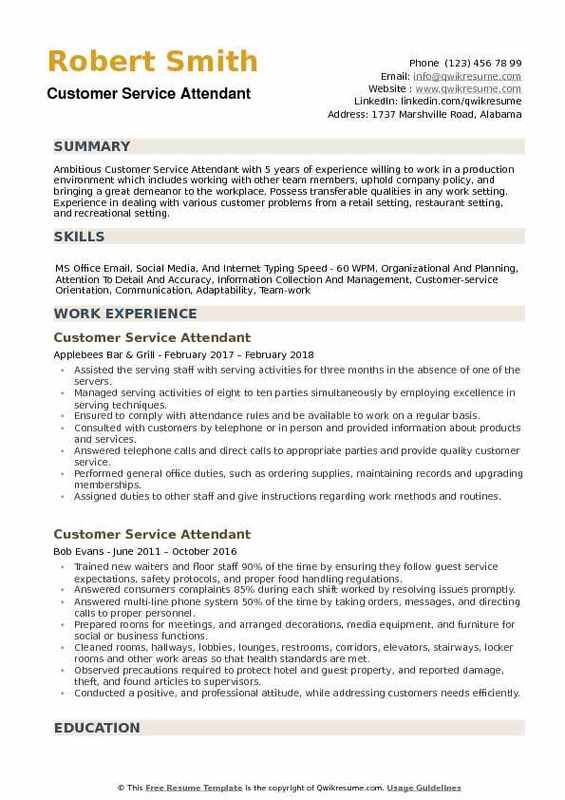 Summary : Senior Customer Service Attendant with 9 plus years of experience. My goal is to become associated with a company where I can utilize my skills and gain further knowledge and experience while enhancing the company's productivity. Skills : Exceptional Customer Service, Outstanding Organizational, Project-Oriented, Ability To Communicate Effectively With Various Cultures And Socio-economic Backgrounds. 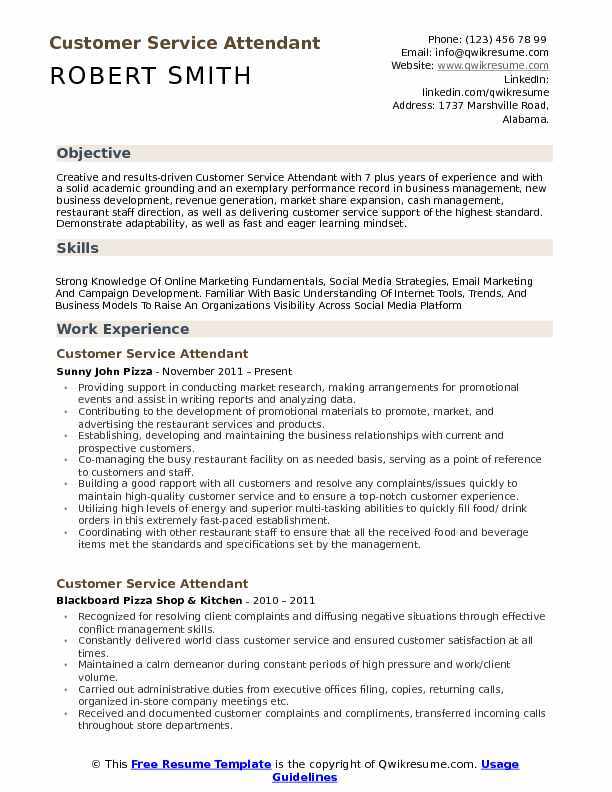 Executing critical thinking skills, attentive listening, and problem-solving techniques by dedicating 35-45 hours of work per week in order to provide outstanding customer service and validate the restaurant's credibility. Collaborating with other food service professionals to accommodate the restaurant's services to customers needs. Developed a comprehensive training agenda for and mentored new customer service attendants. Implemented the U.S. food and drug administration protocols for safe food handling and infection control in order to promote public health safety. Augmenting the restaurant's operational efficiency by analyzing inventory expenditures regularly in order to achieve higher profit margins. Tended the bar and served all food with high energy and a positive attitude. Anticipating the customer needs, providing advice and assistance as necessary. 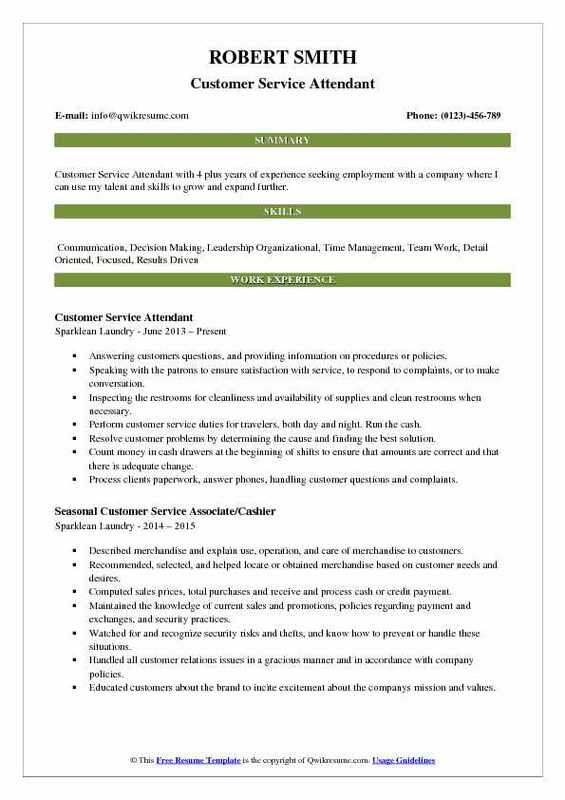 Summary : Customer Service Attendant I with 12 plus years of experience is seeking to aid in the progression of an organization in order to reach their maximum potential while utilizing my skill set and work ethics in an environment that promotes character development and advancement opportunities. Quickly handling refunds and returns when a projector malfunction during a presentation. Giving reviews and opinions on feature films when questioned by a customer. Signing for materials and shipments on behalf of the theatre including the delivery of valuable film reels. Establishing proper boundaries by professionally attending to specific customer needs. Handling large amounts of revenue and received bonuses for outstanding performance. Providing excellent consumer relations in accordance with company policies. Receiving payments and operating the automated cash register and card scanner to handle transactions. Managing the cash drawer, coupons, and checks. Providing the necessary job duties of merchandising, food/beverage management and maintaining a safe, secure environment within the store. 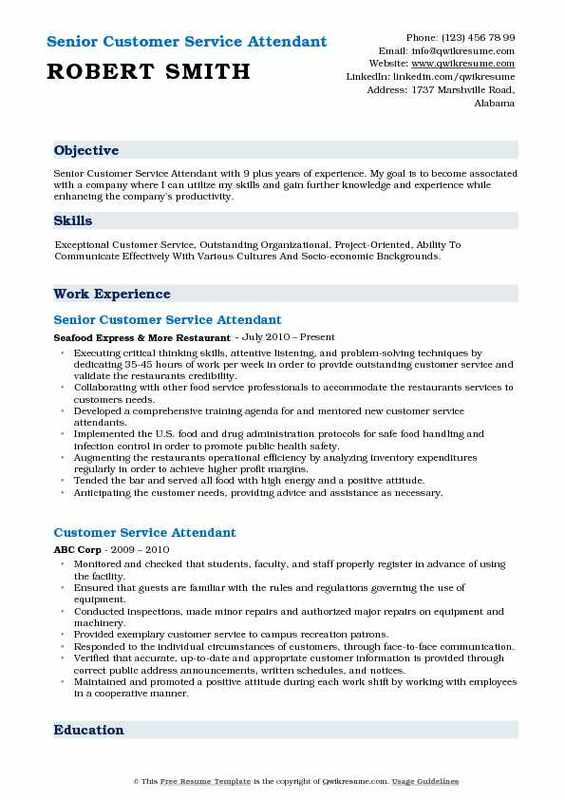 Summary : Ambitious and efficient Customer Service Attendant with seven years of experience helping meet customers needs. 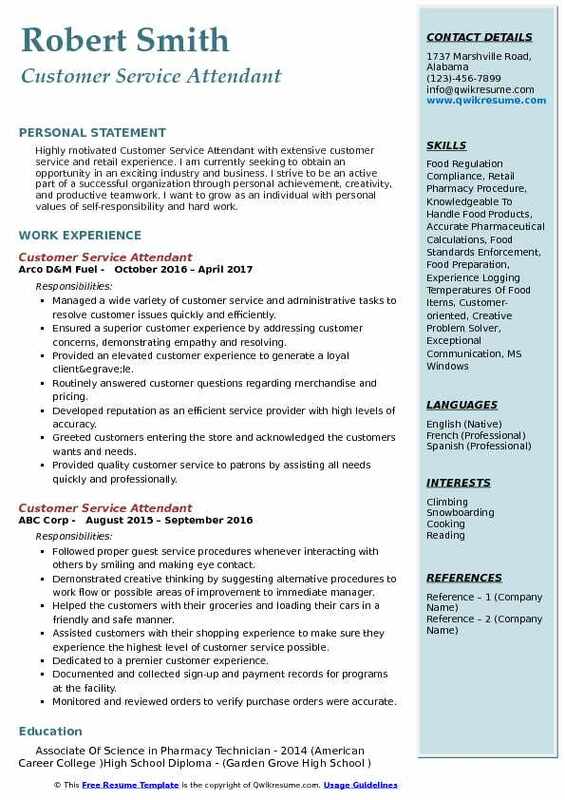 A motivated and reliable individual seeking to contribute my skills and positive attitude in a work environment that allows me to continuously improve. Received cash from customers and made a change or charged purchases to customers debit or credit cards and provided receipts. Managed hundreds of dollars in cash and credit card transactions and maintained accuracy. Ran fuel pumps and filled tanks of vehicles with gasoline or diesel fuel to particular levels. Received instruction from customers and satisfied requests to promote repeat business. Provided the fastest service possible so that customers were able to quickly make purchases. Multitasked at the various back of house stations when understaffed to ensure that business operated smoothly. Ensured that cash drawers and change bags are accurately counted to provide an accurate picture of the businesses current cash balance. Performed daily cash balance journals to log sales figures and ensure accuracy for accounting purposes. Summary : Dedicated, results-oriented Customer Service Attendant with 8 years of experience, who works well independently and in a team environment with limited supervision. Provided excellent customer service to 45,000 patrons and enforced all campus recreation policies and follow all established procedures. Performed a variety of duties to support the member services department of campus recreation. Responsible for increasing add price monthly sales, promoted sales on existing items. Maintained cleanliness and orderly aisles answered the phone and responded to the customer that need assistance and stocks shelves upon monthly shipments. Performed sales transactions for memberships and rent out various sports equipment. 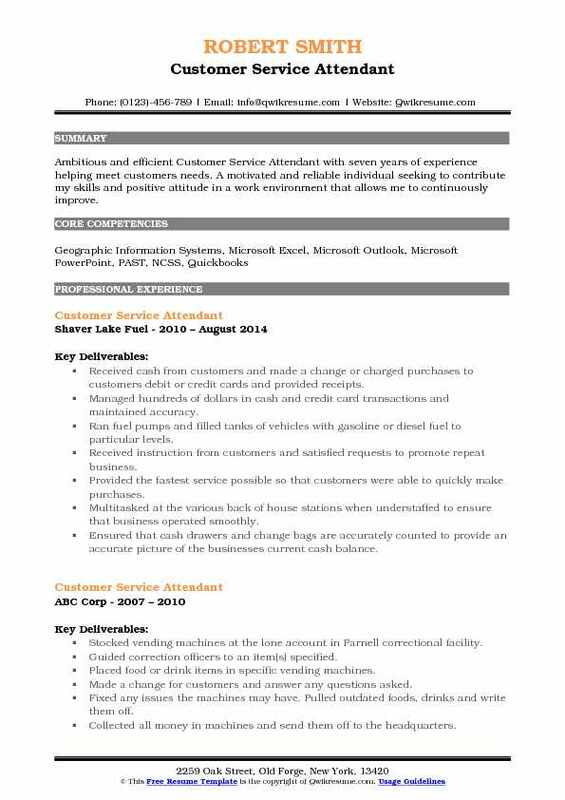 Excelled in a service-oriented company, demonstrating a talent for communicating with customers from different backgrounds. Trained 5 new employees on operations of facility equipment, pos systems, and safety procedures. Operated the customer service desk, while answering a high volume of calls. Headline : Ambitious Customer Service Attendant with 5 years of experience willing to work in a production environment which includes working with other team members, uphold company policy, and bringing a great demeanor to the workplace. Possess transferable qualities in any work setting. Experience in dealing with various customer problems from a retail setting, restaurant setting, and recreational setting. Assisted the serving staff with serving activities for three months in the absence of one of the servers. Managed serving activities of eight to ten parties simultaneously by employing excellence in serving techniques. Ensured to comply with attendance rules and be available to work on a regular basis. Consulted with customers by telephone or in person and provided information about products and services. Answered telephone calls and direct calls to appropriate parties and provide quality customer service. Performed general office duties, such as ordering supplies, maintaining records and upgrading memberships. Assigned duties to other staff and give instructions regarding work methods and routines.